Wet scrubbers are an economical and effective method for final cleansing of exhaust air to reduce dust and odor emission before discharge to the atmosphere. Evaporator Dryer Technologies designs wet scrubbers for high efficiency dust collection, low maintenance, water level control, low pressure drop and minimum water usage. The scrubbers are available in a sanitary design and non-sanitary design that can be cleaned (CIP) with the rest of the spray drying system. In a spray drying system, some dust particles (powder) in the air stream escapes collection in the cyclone. A wet scrubber used in conjunction with a cyclone, will provide the secondary cleaning of the air stream before discharge to the atmosphere. The cleaning is accomplished by spraying, or saturating the air stream with a liquid for final air cleaning. 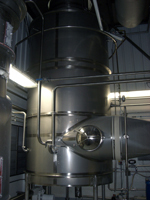 Either product feed or water can be used as the scrubbing liquor to entrain and recover the dust particles. By using product feed the wet scrubber recovers what would otherwise be lost product.